Abacus House Bone Lane Newbury has just been brought to the market by Richardson Commercial. 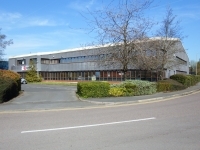 Comprising a former warehouse unit it has been fully fitted as top quality offices by the current owners. The building is some 22,500 sq ft on two floors but could be stripped back to the original size as constructed of just over 13,000 sq ft. Offers around £1.5mn are sought plus VAT.